Elijah now has his two front teeth on the bottom and it looks like the top two won't be far behind... 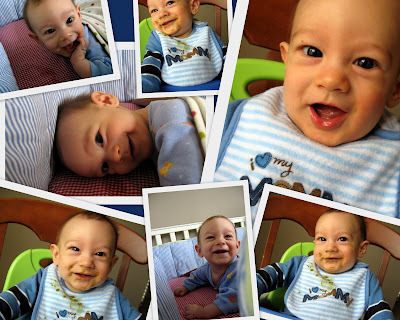 Even though he's been teething for the last couple weeks, he has been his usual delightful, giggling, smiling self. We can't believe what a joy he is! you have the most contagious smile sweet boy! with or without the teeth! happy 6 months! we love you so much. Elijah seems like a happy boy. Enjoy!